A half-plate daguerreotype from the Thom Cole collection is a circa 1850 portrait of a militia dragoon non-commissioned officer in full dress uniform. 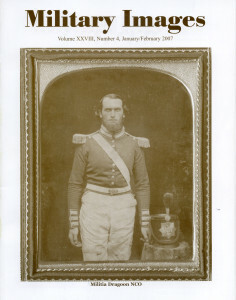 The editor notes that it has been a long while since so many military daguerreotypes have been published in the magazine. He also references upcoming projects. Three books are recommended: Confederate Heroines, 120 Southern Women Convicted by Union Military Justice (Louisiana State University Press) by Thomas P. Lowry; War’s Relentless Hand, Twelve Tales of Civil War Soldiers (Louisiana State University Press) by Mark Dunkelman and The Daguerreian Annual 2005 (The Daguerreian Society), edited by Mark S. Johnson and Dawn Patton. 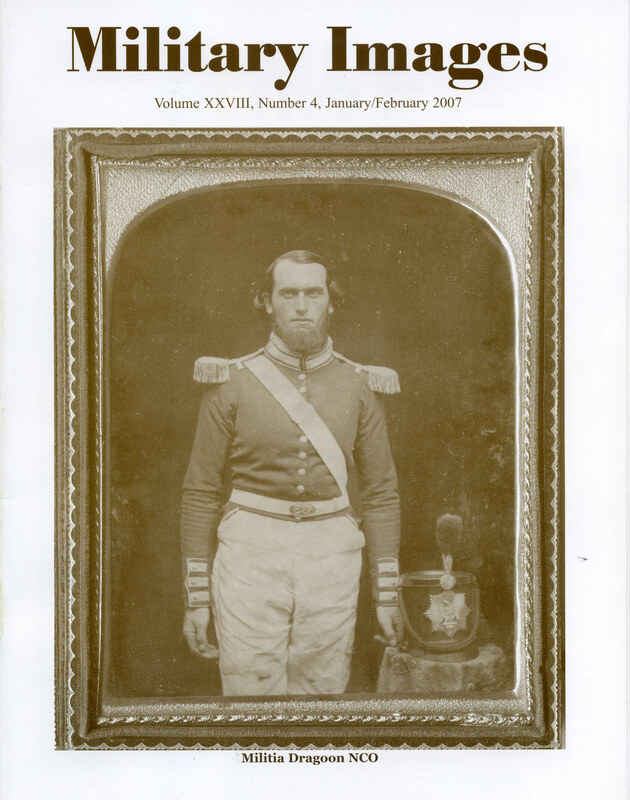 A Q&A with Dr. Schultz by James Ronan II (reprinted with permission by the Company of Military Historians) covers the basics of military daguerreotypes and explores various aspects of the collection. A survey of 22 follows, including identified images of Lt. George H. Gordon, U.S. Mounted Rifles; Henry Ledyard, U.S. Charge d’ Affair in Paris; Asst. Surg. Robert Little Brodie, U.S. Army; Midshipman John Gardner Mitchell, U.S. Navy; Lt. Col. Joseph R. Smith, U.S. Army; 1st Lt. William Root, 5th U.S. Infantry; 2nd Lt. William Thompson Mechling, 3rd U.S. Infantry; 1st Lt. William H. Gray, 11th U.S. Infantry and 1st lt. Robert S. Hayward, 13th U.S. Infantry. Guerrilla fighter William Napoleon “Babe” Hudspeth participated in some of the bloodiest raids of the Civil War. He rode with the likes of William Quantrill, Bloody Bill Anderson and Jesse James and survived his war experience. He died in 1907. The story is illustrated with two cartes de visite from the author’s collection. One is Hudspeth dressed in a Mexican Bolero jacket, and the other pictures him with Oscar Thompson, who also rode with Quantrill. In “The Military Daguerreotype,” McAfee shares his memory of the first military daguerreotype he purchased, how he came to sell it to well-known collector Herb Peck Jr., and memories of other similar images that passed through his hands. Four images illustrate the column. A ninth-plate ruby ambrotype from the Steven Karnes collection is a portrait of an unidentified South Carolina private who served with the Holcombe Legion. The background of the image includes a circa 1846 daguerreotype of the same man dressed in civilian clothes. A half-plate ambrotype from the David W. Vaughan collection pictures an unidentified Confederate officer with cavalry-style saber. A daguerreotype from the Fred Sherfy collection is identified as “Uncle Issac Hull in Civil War.” Though not a Civil War era image, Hull may have served in a militia company.